There were plenty of impressive concept vehicles on display at this year’s Geneva Motor Show, including electric SUV concepts. For example, there was an all-electric Kangaroo “hyper-SUV” concept on display from a unique design company. 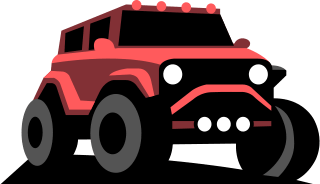 The vehicle is able to drastically change its ride height to transition from a lightning fast sports car, to an off-roading monster. The Aston Martin Lagonda is another SUV concept that made headlines at this year’s show. Aston Martin has promised the “All-Terrain” SUV will enter production in Wales in 2022, so that’s making people even more excited about this behemoth of a sports utility vehicle. It, too, is electric and Aston Martin also claims fully autonomous and zero-emissions driving. It’s incredibly luxurious inside and out. There’s even Swarovski crystals embedded into the vehicle’s seats! 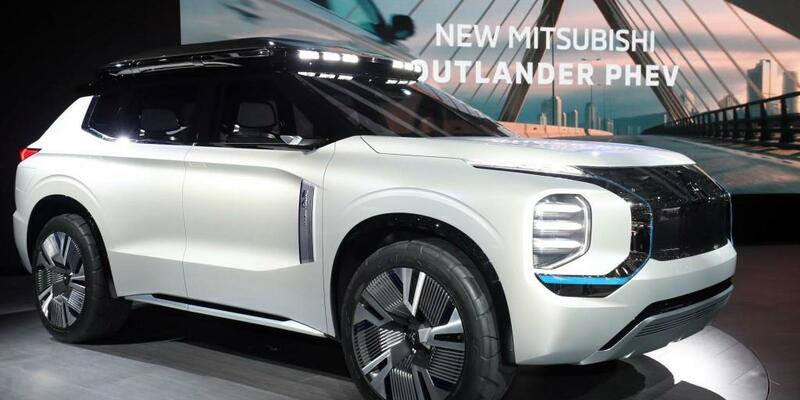 A third wild electric SUV concept to wow car lovers at this year’s motor show in Geneva is the Mitsubishi Engelberg Tourer. The SUV concept is named after a well-known ski resort in Switzerland that offers incredible, pristine runs for skiers and snowboarders. It uses a plug-in hybrid powertrain with a 2.4-liter engine and four-wheel drive system. It has a driving range of over 434 miles. Continue reading below for more details about these three SUV concepts! Automative Hall-of-Famer Giorgetto Giugiaro and his son, Fabrizio, are behind the Italian company GFG Style that had its “hyper-SUV” concept on display at this year’s Geneva Motor Show. It’s called the Kangaroo and it resembles some of the other supercar concept designs we’ve seen. But, this one is different from the rest. A special adjustable hydraulic suspension system helps convert the concept from a sports car to an off-roader. Ride heights are able to vary from 5.5 inches in “Racing” mode to some 10.2 inches in “Off-Road” mode! The car’s front splitter can also retract while in “Off-Road” mode to improve approach angles on challenging terrain. Talk about a transition! GFG Style says the Kangaroo can be used on any surface, from pavement, to sand, to mud. It comes with two electric motors, each rated at 241 horsepower. The combined output is listed at 482 hp and 501 lb.-ft. of torque. A 90 kWh battery pack is said to deliver a driving range of more than 280 miles on a single charge. 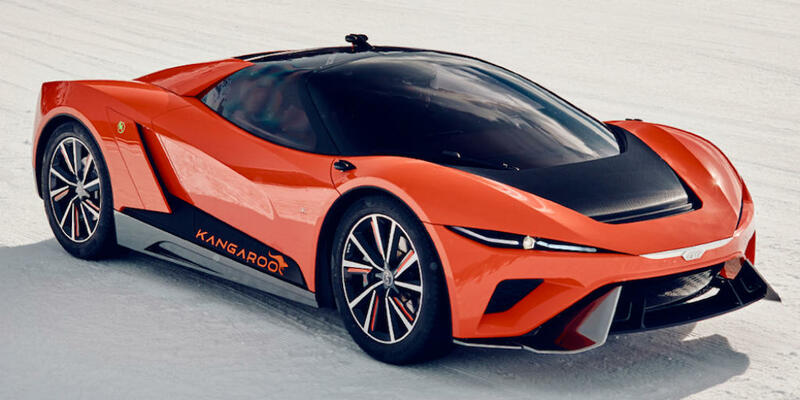 While we’re certainly not holding our breath for this vehicle to make its way to production, GFG Style says it does plan on showing off a version of the Kangaroo concept wearing snow tracks. The design company wants people to see how the Kangaroo could used for fun, while conquering some snow-covered terrains. 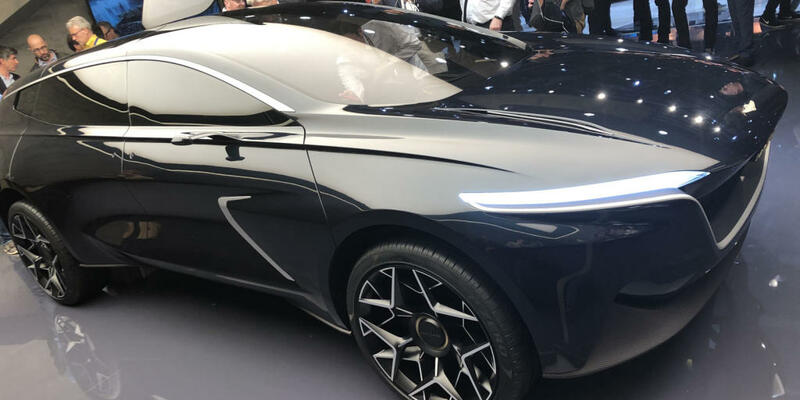 At last year’s Geneva Motor Show, Aston Martin impressed crowds with its Lagonda Vision Concept, which sort of resembled a limousine. This year, the company brought a similarly inspired, but more practical vehicle. 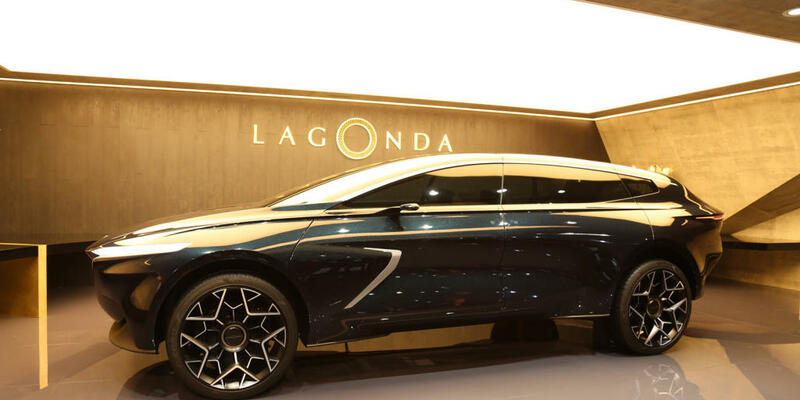 The luxurious Lagonda “All-Terrain” Concept is definitely a show stealer. It’s still a large vehicle, with an impressive and almost perplexing amount of space inside. The SUV’s doors are longer than a smart car! The Lagonda All-Terrain Concept exudes luxury, from the gorgeous exterior curves and rear-hinged doors, to the four-seat spacious interior (which is also made of vegan materials)! In addition to the neat doors, there are sections of the roof that beautifully open upwards. To help make the interior feel more like a living room during autonomous driving, the two front seats can rotate to face the rear passengers. Another pleasing element of this concept is the rear shelf, which slides out from the floor. Hidden, flush with the body when stowed, this shelf serves as a platform for occupants to perch on. Aston Martin claims fully autonomous and zero-emissions driving with this SUV concept. While the company was light on specifics, we know its batteries are stored in the floor. Storing them there actually also helped make the vehicle stiff enough for the addition of the rear-hinged doors. This latest concept comes as Aston Martin looks to uplift its Lagonda sister brand and make it into one that will “confound traditional thinking.” It also comes as Aston Martin prepares to unveil its first luxury SUV, the DBX. The DBX will actually be made at Aston Martin Lagonda’s St. Athan, Wales facility, where this new Lagonda All-Terrain concept will later be made. While the DBX is scheduled to be unveiled in the last quarter of this year, we’ll have to wait until 2022 for a production version of Aston Martin Lagonda’s All-Terrain concept. Named after a Swiss ski resort, this SUV concept boasts a plug-in hybrid powertrain, with a 2.4-liter engine, four-wheel drive system, and the ability to travel up to 43 miles on zero-emissions. The total range, meanwhile, is said to be over 434 miles. The Engelberg concept has a bit of a boxy look and features LED DRLs, chrome detailing, and front and rear skid plates. There’s a roof-mounted box, which has an auto open/close feature. There are fog lamps fitted to that box. Inside, there’s plenty of space. White leather is used for the three rows of seats. The modern blue lighting found on the exterior is also featured inside. Mitsubishi also had its Dendo Drive House system on display in Geneva. The packaged system comprising the EV/PHEV, a bi-directional charger, solar panels and home battery is designed for domestic use. It’s meant to help reduce fuel costs and lower electricity bills. It can even act as a backup generator.